These darker, colder days call for warming sustenance and where better to turn than to the fragrant spices of Middle Eastern cooking? Harira is a soup I love to make when the weather turns, a traditional Moroccan dish which uses vegetables, spices, chickpeas and can include lamb for extra nourishment. Everything is cooked slowly to bring out the maximum flavour and if you make a big batch, it will keep for a few days in the fridge so you can warm up a bowlful for a fast and healthy meal. I add a spoonful of harissa, a North African sauce made with chilli pepper, paprika, cumin and other spices for extra warmth and depth of flavour. 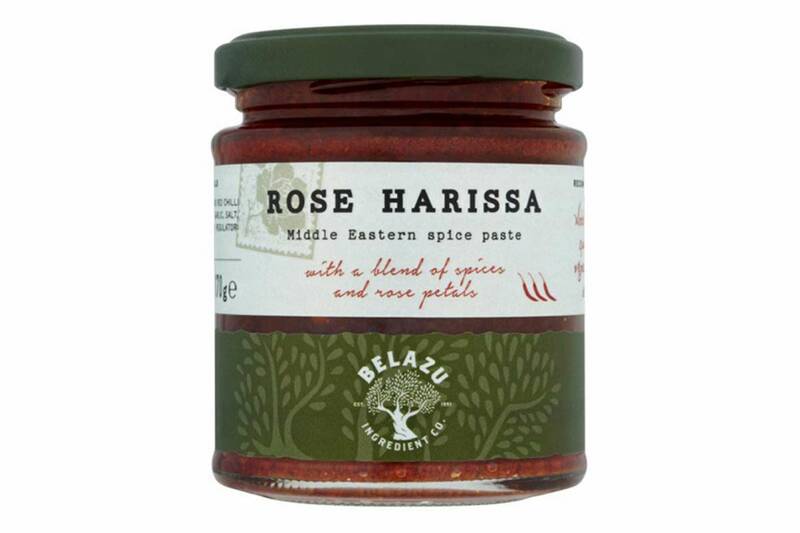 I’ve recently been using Belazu’s Rose Harissa which includes dried rose petals. This may sound odd, but it provides the delicate scented experience often found in Moroccan food where fruit, nuts and rose petals are often used in savoury dishes. A jar of harissa never goes to waste in my kitchen: one of my favourite breakfasts is fried eggs with rose harissa, toasted Poilane and a dollop of cooling yoghurt. First make the brine: put all the ingredients into a large pot and bring to the boil to dissolve the salt and sugar. Allow to cool to room temperature. Find a container – stainless steel, ceramic or plastic – don’t use aluminium which will taint the flavour – large enough to fit both the birds and the liquid. Refrigerate for 4-6 hours then remove the birds, rinse well under cold water and dry thoroughly. You can now keep the birds for up to 2 days in the fridge until needed. Fry the bacon pieces until crisp then add the shallots and thyme and cook for a couple of minutes to soften. Return the pheasant to the pan with the juniper berries and pour over the cider. Boil for a minute to cook off the alcohol and reduce the liquid slightly. Add the stock and season well. Reduce to a simmer, cover with a piece of baking paper and cook gently. After 20 minutes, take out the breasts, then cook the legs slowly for another 20.